The Japanese have a mirror in their hearts that loves them. I have started applying my theory of Japanese culture, which I call Nacalianism - Lacanianism backwards - in my English conversation classes. I argue that the Japanese move from the symbolic stage to the mirror stage and remain there (or would, were it not for the efforts of Japan's leaders to Westernise Japan). This means that when forced to speak English, they feel as bad as Westerners do when they are forced to sit in front of mirrors. The experience of focusing upon their speech creates in them an "objective self awareness" similar to that created in a Westerner in front of a mirror. Since the Japanese do not enhance in the linguistic modality, nor Westerners in the visual, they find it unpleasant. In order to make English class more pleasant therefore it helps, I believe to increase Japanese students' visual self awareness still further such that they are so visually aware of themselves that they do not become depressed by their objectification in English conversation. This has in the past been achieved in at least two ways. Before the famous English conversation school, Nova, was forced into bankruptcy I noticed that one of the features of Nova classrooms was that they had glass walls. 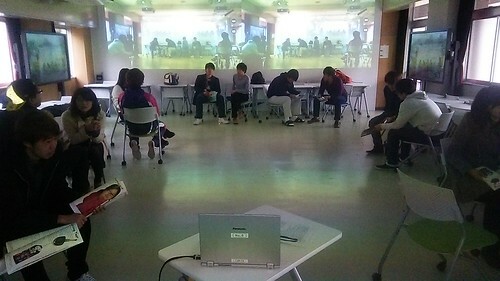 There was a Nova classroom in Kyoto station where passengers could see students taking English conversation classes at Nova. At other Nova establishments in less public places the students in one class could see students in others. This sense of seeing and being seen increased, I believe, their visual self awareness such as overcome the negative affect of verbal objective self awareness in the land without a verbal Other. Another thing that I have noticed in those rare Japanese that speak English well is their tendency to move their hands a lot. This may be simply in emulation of foreigners and to get into the spirit or culture of the English language but often these gestures appear rather different to those of English speakers, and more like the speaker is conducting himself. I think perhaps that this self-conduction encourages Japanese English speakers to visualize themselves and again, combat the negative affect of verbal objective self awareness. In my class today I failed to encourage students to conduct themselves, and could not take them to a glass walled classroom but I did set up a web camera so as to display a view of the students on the walls of the class. I found that this improved the overall atmosphere of the class and the students ability to speak English.